This Sunday 7th February 2016 sees one of the biggest sporting events in the world take place, the Super Bowl. The Denver Broncos will take on the Carolina Panthers at the Levi’s Stadium, in Santa Clara, California. This year will be even more special as it’s also the 50th edition of the Super Bowl. The popularity of American Football and the NFL in the UK has grown significantly over the past few years and now sells out national football stadiums on a consistent basis. Since 2007, more than half of the league’s 32 teams have travelled to London to play, and the sport’s governing body says it “fundamentally believes” there will be a permanent franchise there by 2022. 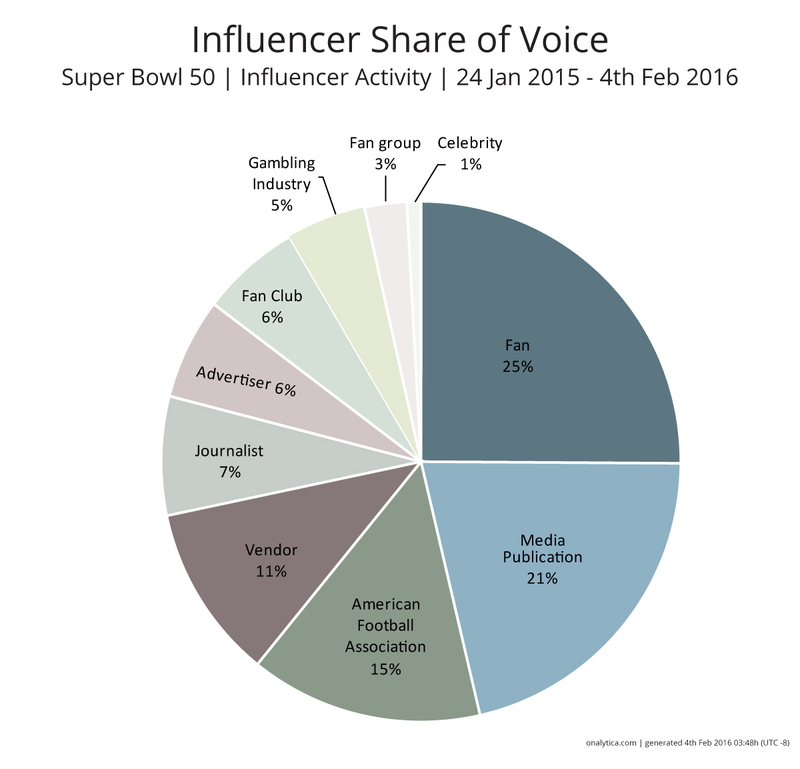 We were interested in finding out who are the key influencers driving attention in the run up to Sunday’s big game, so we identified and categorized key influencers around the topic of NFL and analysed their Twitter data to see who has the biggest share of voice in the UK on the topic of the Super Bowl. 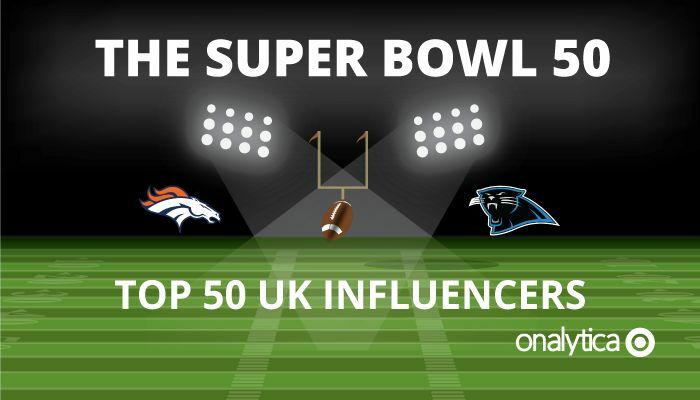 Out of the 400+ NFL UK influencers identified, we were keen to see who ranked in the top 50 in the run up to the big game. It’s interesting to note media publications driving the most engagement so far are The Guardian, Sky, The Evening Standard, and 5 Live, as well as presenters such as Darren Fletcher for BT Sport. Gambling organisations such as Coral, bet365 and William Hill also feature quite highly. Out of the celebrities, Vernon Kay is leading the discussion, and out of the fans GabeUKSaintsFan and NFLGirlUK are igniting conversations. 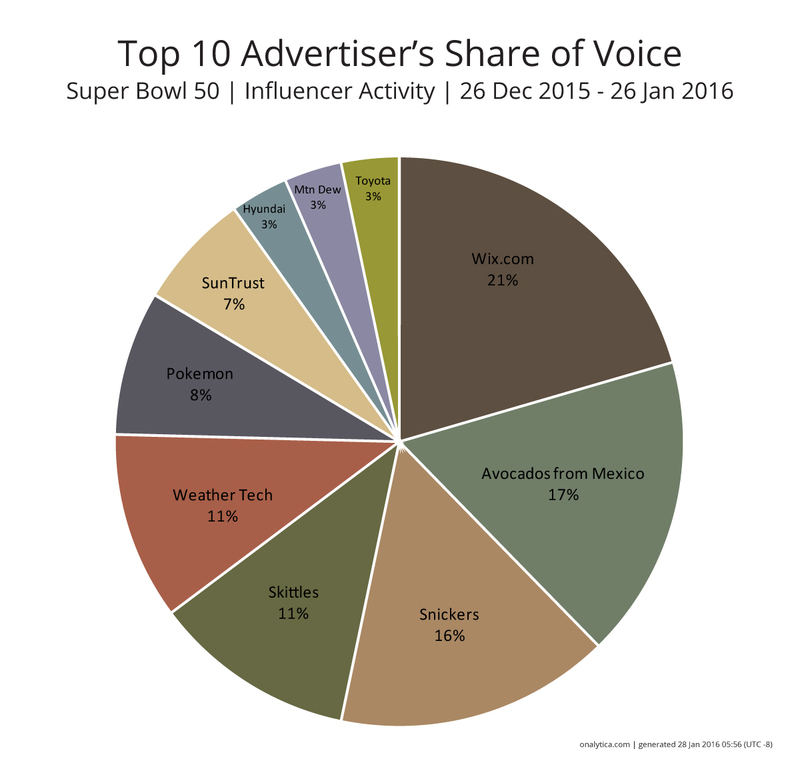 Look out for our full analysis next week where we will be analysing the global influencers who drove the most engagement at the Super Bowl as well as looking more closely at how the advertisers did during the game. At Onalytica we love building these lists and want to give back to our loyal readers as much as we can. If you’re interested in other topics (such as Machine to Machine, Wearable Tech, Internet of Things) be sure to have a gander on our blog or why not propose some topics to us on twitter? We also build some very cool software to manage all of these influencers. Get a free demo today by clicking the button below! Disclaimer: As ever with these lists, it must be stressed that the ranking is by no means a definitive measurement of influence, as there is no such thing. The brands and individuals listed are undoubtedly influential when it comes to driving discussion in the cloud debate.